The true worth of information is deduced from wisely using the data and not just possessing it. Every customer has - at least once - been through the annoying experience of receiving repetitive communication to sell the same service or product from the same company but different sales people. This is frustrating and raises a vital question - Why are some organizations only good at accumulating information but do not know how to use it in an intelligently co-ordinated manner? It is thus obvious that degradation of customer information could be rapid in today’s connected world if timely measures are not taken to correct it. As CRM professionals embark on the journey of restructuring business models and remodeling information technology infrastructure to suit the evolving economy, the undoubted significance of a Single 360 degree Customer View (SCV) comes to surface. This transformation needs to be supported by Cloud CRM solutions with workable, astute plans and an accurate roadmap to achieve the goal of a Single View of Customers. It is very important to have a holistic, yet spot-on view of any one customer across multiple channels and LOBs. Achieving a wide-angled customer perspective and yet bringing sporadic data down to ‘complete’ information about ONE customer, is what a Single Customer View is all about. Apart from mandatory profile details like demographics, it accurately includes each and every aspect of the Customers’ interactions and communications with the Company, like marketing & purchasing history, interest in products and services, support interactions and such other details, all at one glance. A Single Customer View delivers complete Customer data directly to the work desk in a user friendly interface. A single view can help an organization reach unrivaled levels of customer intimacy. Hence, achieving it should be an important objective for every organization to ensure guaranteed success in today’s business world. To be able to gain an absolutely clear perspective of customers, it is imperative to eliminate flaws like discordant database repositories, record duplication, disintegration and inaccessibility of important information – basically just ‘poor quality of data’ in a nutshell. The cascading effect is the inability to achieve meaningful and well-directed CRM efforts. Given to the problems discussed above and thanks to the multiplication of sources and channels available today, it is becoming increasingly challenging to successfully achieve a single customer view inclusive of all the specific Customer-Company interactions. However, this achievement is not impossible if barriers are quickly identified and broken, and timely corrective strategies are implemented using a high impact Cloud CRM solution. Framing a sustained and consistent SCV starts with the development of a focused strategy built around accurate data. 1. Blueprint: Every business strategy begins with a well-framed blueprint in order to give clarity in understanding how to go about the execution of plans from start to end. In the case of SCV, the blueprint should specify details such as sources of data collection & erroneous patters therein (if any), business rules & regulations for customer data access and control, data privacy, extent of information to be included, system security & audit, data migration, etc. Relevant stakeholders inside & outside the organization should be included in strategic discussions so they can contribute as per requirement. The organization should evaluate existing situations and ascertain what information to include in the blue print. Finally, quantifiable metrics should be assigned to indicate success in tangible terms. 2. Framework and Roadmap: After the basic blueprint and priorities are worked out, the next priority is to create an organized and complete roadmap to be followed, indicative of all the necessary inclusions & exclusions, and all the data that needs to be within the SCV. 3. 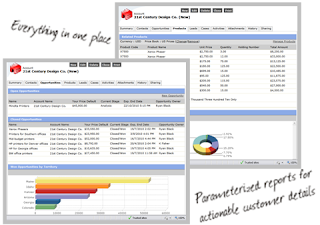 Link: Clients’ voyages span across multiple networks and channels in a company. They like to be worked with on the basis of all their interactions, and expect that every form of activity that they engage in with the company should be properly linked – emails, phone calls, meetings, etc. Aim to meet their expectations. 4. It’s all about Data: Organizing and managing large scattered chunks of customer data is by default what a single customer view helps achieve. This includes being able to prioritize data inclusions, achieve data standardization accurately for all customer records plus augment and integrate spread out information. Doing so will provide an end solution to deliver a single view. Rapid technological changes and variance in company IT structures makes data standardization and consolidation increasingly important. 5. Segment: In any Cloud CRM solution, the value of segregating heterogeneous customers into groups with similar characteristics and requirements is already common knowledge and clearly understood. Based on the information companies possess about customers, skillfully segmenting them in terms of products, services and offers is necessary. Division into similar groups helps identify relevant sales opportunities towards each group based on predetermined criteria. Sales personnel are therefore able to deliver personalized and timely alerts to the necessary sections based on the pattern of their activity. In this way, organizations’ efforts remain rightly directed, proving how sensible segmentation goes hand-in-hand with a CRM Single Customer View. 6. De-duplication: It is very important to have de-duplication systems in place as they ensure perfect co-ordination between information and display correct matches between contact details. For example, more than one client may have the same name, but the de-duplication system will help to match the correct name with the correct phone number, address, account number, etc. and display one single relevant record to the user as requested. 7. Dedicated Database: In large organizations with numerous employees spanning across several departments, there are different information gathering systems. This necessitates the availability of one consolidated database for each department, so that its employees can gain access to relevant customer records as and when required. SCV is important here. 8. Completeness of Information: Organizations need to ensure stale and redundant data is eliminated and that only accurate, important information is available in their systems. For example-leads that were closed more than 18 months back should not be entered in CRM solutions again. This can be ensured through a CRM solution’s ‘purge’ option. At the very initial point where data enters the system, cleansing should be used, which works as an effective tool to avoid unwanted data at the entry point itself. All of this should have the ability to interact in real-time hence bringing down human error to the minimum. 9. Wholeness in Perspective: Every organization has different business dimensions, and needs to include SCV in their database systems for various reasons unique to them. The specific inclusions in a single customer record will vary between organizations. It would be a wise business move to start applying SCV in particular projects (with metrics assigned) and aim to deliver them within a stipulated time period. This would help gauge to what extent and how well the plan has contributed to success. It is also critical to align people and processes with IT infrastructure to gain a comprehensive perspective. 10. Monitor, Make Space for Innovation and Betterment: Implementing a single customer view is the strategic imperative for better efficiency of work staff, preventing leakage of sensitive data, compliance with rules and regulations, cost saving, and consequential rise in revenues and profits. It also ensures that profitable clients are not lost. All this indicates that a standard customer record has unlimited opportunities for improvement and updating. It is hence vital to constantly monitor the progress of these systems and pave the way for innovation and bettering processes, people and technologies. Organizations need to understand how to convert their information assets into a business advantage. ‘Good Customer Relationship Management’ translates to ‘Great Customer Information Management’. A Single Customer View delivered using high impact CRM solutions, assists companies to provide different departments with organized customer information, with which they are better equipped to make informed business decisions. Organizations which succeed in the development of a Single Customer View, improve their ability to keep customers satisfied (through effective customer service and support), resulting in higher customer retention. From a company’s point of view, it helps in generating higher revenue per customer. A dedicated, Single Customer View brings improvement in product positioning and lifetime value, ensuring that far-sighted companies can move from transactional business models to a genuine and focused customer-orientated approach.